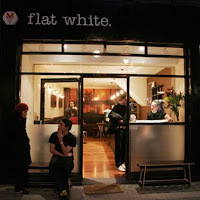 The Find: Flat White, located in Soho London, is a very popular destination amoungst coffee lovers and locals alike. Since it opened in 2005 it has quickly become a name to know and a place to go. 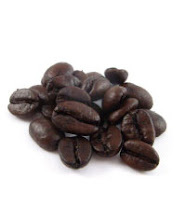 With beans sourced from Square Mile Coffee roasters (recently changed from Monmouth beans) you're in for a coffee treat. Despite being geared up to be a coffee bar, they also do a selection of food ranging from sandwiches and bagels to anzac biscuits and muffins. Order at the bar, sit down (if you can get a seat!) and enjoy the sounds of milk pitcher banging, shot pulling and espresso bean grinding, all sounds which show these guys know what they're doing. Flat White supports local artists the way they should be supported - the art changes regularly and is clearly appreciated. The music, which is suitably antipodian, suits this place down to a tee. Oh and check out the cups hanging by the door. Looking for a good coffee in the capital? You've found it here. Order a flat white... it would be rude not to . . .